AAA is predicting that more Americans will travel this holiday season, despite a sluggish economy, but they will likely venture less far than last year. The motor club estimates that 91.9 million U.S. residents will travel 50 miles or more from home, a 1.4 percent increase compared with 2010. And perhaps because of the sluggish economy, most of them will drive, with 83.6 million U.S. residents planning to hit the road—a 2.1 percent increase over last year–according to AAA. According to AAA, 59 percent of those planning to travel feel that either the economy has no impact on their plans or their personal situation has improved enough to make their plans feasible. The remaining 41 percent said they were scaling back travel plans because of economic concerns. That is a change from last year, when 67 percent of intending travelers said their plans were not impacted by the economic conditions. Along with increased roadway traffic comes heightened risk of vehicle accidents and other problems. Federal safety officials say December and January are the months with the greatest number and rate of vehicle crashes. According to 2009 data from the National Highway Traffic Safety Administration (NHTSA), there were 539,000 crashes in January and 525,000 in December. 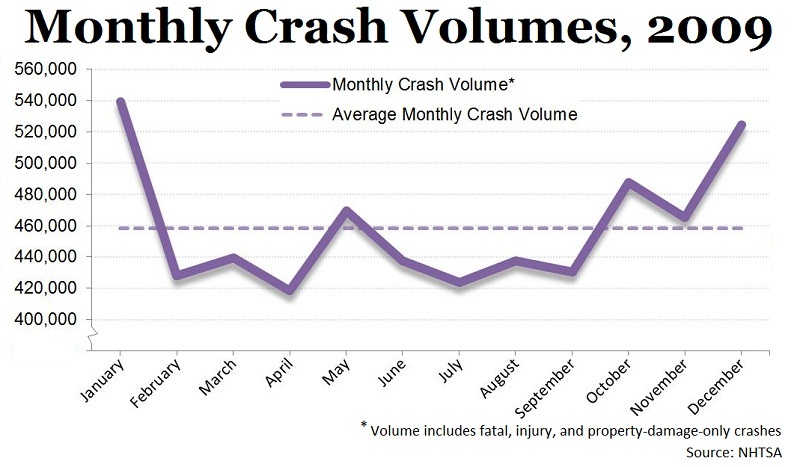 The average monthly crash volume was about 459,000 for that year. Safety officials say being involved in a crash—even one in which no one is seriously hurt—can be a traumatic experience with long-lasting effects. And insurance industry experts say the impact of accidents on auto insurance rates can be significant for those who are found to have been at fault in crashes.